India is an agricultural nation, and the prosperity of the people depends on the quality and quality of produce. But poor farmers don’t possess the financial power to implemented necessary farming essentials. Thus, they fail to increase the quality and quantity. The CM of Jharkhand has announced a new scheme that has been targeted towards the development of the Kharif crop growers. The name of this project is Mukhyamantri Krishi Aashirwad Yojana and it will be rolled out from the next financial year. Development of farmers – The main objective of the state government is to pave the path for the development of the agricultural labors. With the money, they will be able to grow better crops, without worrying about credit. For kharif crop growers – Another aspect of this scheme is that only kharif crops will be considered under this agro-project. If the farmer grows kharif crops, only then he will be able to register for this financial assistance. Total number of beneficiaries – The authority is hopeful that it will be able to reach out to as many as 22 lakh 76 thousand eligible agricultural workers with this beneficial package. 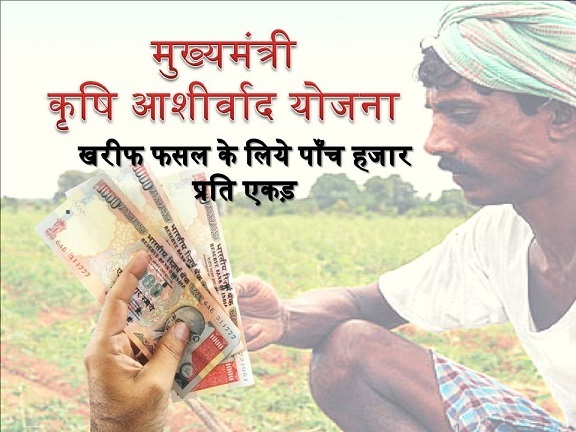 Financial assistance offered by the state – The Jharkhand government has announced that it will offer all farmers Rs. 5000 for every acre of land holding. Payment mode – The authority will make the specified payment on an annual basis. Thus, each year applicants will receive the money according to their land holdings. Money to be spent on – The state authority has highlighted that all beneficiaries of this scheme will be able to use the money to attain farming related supplies. They can spend the money to purchase good seeds, or agricultural tools and fertilizers. Residential requirement – Only those farmers, who permanently reside in Jharkhand, and have residential proof, will be able to attain the benefits of this scheme. Professional requirement – The state has highlighted that only small and marginal agricultural labors will be able to attain the benefits of this scheme. Thus, applicants must produce their landholding related documents to support this claim. Personal ID proof – The voter card or the Aadhar card of all applicants is a must ID proof. The authority will use these papers to track the beneficiary list. Bank details – The state government will deposit the money in the bank account of all applicants. Thus, it is mandatory for all farmers to have and provide their bank account details during application. How to get the application form and register? The scheme has only been announced by the Chief Minister of the state. It has not offered any details instructions about the actual launch date or the mode of registration. Once the state government comes out with these details, we will offer the information on this site. Farmers need to depend on additional financial assistance from other sources to meet their requirements. With the implementation of the scheme, the authority will eliminate the presence of third party money lenders. With this monetary assistance, agricultural labors will not have to worry about high interest payments.